I’m not a great believer in New Year’s resolutions (they generally last no more than a week), so I gave up making them years ago. This year, though, I do want to make one—one that is related to my health and fitness. I want to lose 10–15 pounds by June 2015. 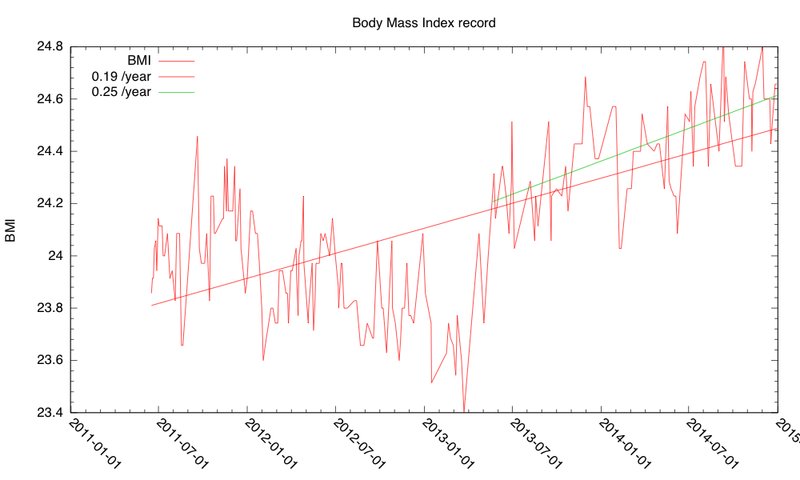 My “body mass index” has been creeping up for the past 21 months. I’m in danger of passing the BME≥25 threshold to “overweight” in about 19 months if the recent trend continues. I think I felt healthiest when my BMI was about 21.6, but I’d be happy to get my BMI back in the range 22.5–23, which is where it was around 6–10 years ago. Most of the weight I’ve put on since then is around my waist, which is not a healthy place to be adding weight—I wouldn’t have minded adding muscle mass, but the gain has clearly been in flab, not muscle. Of course, it isn’t enough just to decide to lose weight—I’m going to have to change some of my habits to achieve my goal. But which ones? Exercise and diet are the two main contributors to weight gain or loss. So do I increase my exercise, limit my diet, or both? 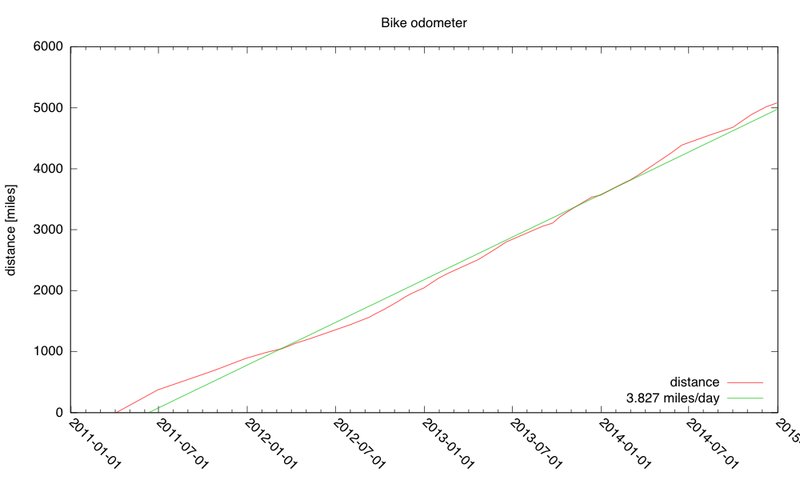 I get adequate aerobic exercise (about 26.8 miles/week of bicycling—see the bike log below), and I’ve never been able to maintain an increased exercise program for more than a few weeks. So I don’t think that exercise will be a major part of my weight-loss program. I may try doing “core” exercises again to trim my waist a bit through increased muscle tone, but that won’t affect my weight significantly. Given that I’m unlikely to sustain an increased exercise regime for long enough to lose much weight, it seems like my best bet will be to try to regulate my diet. I can ask my wife to help by not offering me fattening foods, but most of the effort will have to come from me controlling portion sizes and not eating snacks from the vending machine at work. Skipping lunch or bringing low-calorie lunches from home might help, but I often skip lunch already, so I don’t know how much having better lunch discipline will help. I think that the big changes will have to come in my evening meal. What you listed — basically curbing the consumption of high-calorie food — is probably the right way to go. You are still perfectly withing normal BMI as I am sure you know, but if you feel better thinner so be it. Of course, aging doesn’t help. Don’t skip lunch, in general don’t skip meals — smaller frequent meals help keep the metabolism high. Rather opt for something lighter for dinner when you can, like soup or salad. I do plan to start bringing fruit and vegetable snacks (apples, carrots, celery, …) to work, to replace the high-sugar vending-machine snacks. From what I’ve seen on nutrition labels, granola bars are pretty high-calorie, high-sugar snacks, so I’ll be avoiding them (I don’t care much for the taste anyway). I’m planning to bring sack lunches, but I’m teaching a 12:30–1:40 class MWF this quarter, so I may end up missing lunch or having a very late one, anyway. In terms of weight loss, dieting is far more efficient than exercise. For example, 45 minutes of threshold workout for me (ie highest heart rate I can maintain for extended periods – like a time trial on a bike or a 10km running race pace) will burn less than 500 calories. 500 calories is not a lot of food, and a person would likely have to offset some of the calories they burned with more food (typical post-workout food to help recovery). Of course exercise is important for general health so it has other great benefits. As for eating, I think there are two main guidelines. First, avoid as many processed foods as possible (which is what you are describing above). Second, chances are that if you don’t feel a little bit hungry, you’re probably eating too much. In terms of accomplishing a goal of eating less I think the best plan of action is to first count your calories for a couple of weeks. Then calculate an estimate for how many calories you should be eating and do that for a couple of weeks. After that, you should have a good feeling for how much you are eating (in calories) and how it feels to be eating the right amount. Calorie counting is one of those things that would kill the diet attempt within 4 days. So far, I’m going with “stay a little hungry after dinner” and “eat all you want for lunch, but only raw fruits and vegetables” as being guidelines I can probably manage to make into habits.